Dogs of all shapes and sizes love tiny treats – the more, the better. 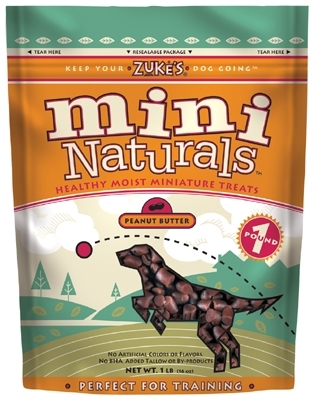 Mini Naturals are the perfect size for frequent rewards without overfeeding. Trainers love them as much as dogs do! Each moist little morsel is packed with the natural great taste of premium salmon, chicken or peanut butter, plus vitamins and minerals to keep your dog healthy. Ingredients (peanut butter): Peanut butter, rice flour, barley flour, oat flour, vegetable glycerin, water, fructose, gelatin, carrot flakes, apple flakes, molasses, calcium carbonate, cultured whey, lecithin, minced garlic, acetic acid, salt, natural smoke flavor. Vitamins: C, A, D3, E, B12, B1, B2, B6. Minerals: zinc oxide, niacin, taurine, copper sulfate, selenium, calcium pantothenate, manganous oxide, biotin, folic acid. Guaranteed Analysis (peanut butter): Crude Protein 10% (min), Crude Fat 6% (min), Crude Fiber 3% (max), Moisture 29% (max), Calories: approx. 2 per piece.